Jeff and I got an early start Thursday morning and drove south past Salt Pier. I’d seen the dive site ‘Tori’s Reef’ named on many people’s “must dive” lists, so we decided to check it out. The entry was similar to all the southern dive sites, a rocky ledge, but at this site you actually enter down the sides of a channel cut through to the salt pools. When the gates are closed and water isn’t being sucked in, it’s a little easier to climb down the edge there and walk out through the sandy channel, rather than having to deal with the slippery rocks and urchins along the usual beach. The dive here started in about 8 feet of water. As soon as we dropped down, we found clumps of coral that were home to all kinds of interesting little fish. 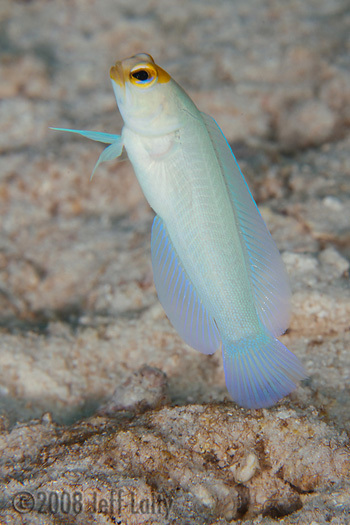 They swarmed with juvenile damselfish and bright orange and blue cherubfish, and occasionally with jacks cruising overhead in search of a snack. By the time we reached the slope, we’d already been down 40 minutes just tooling around in the shallows. 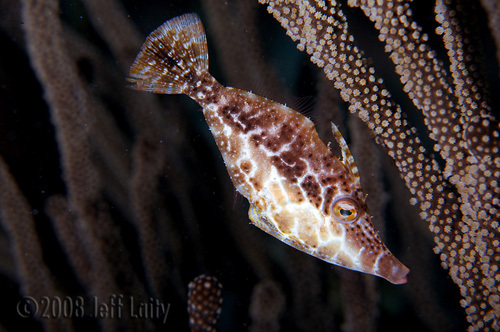 Here we saw more nesting butterflyfish, a barred hamlet, and of course I found lots of slender filefish. Our next dive of the day was also our first boat dive on this trip; we’d signed up for a boat and picked Klein Bonaire as the dive spot (the only area you can’t get to from shore). I think we were all a little underwhelmed by Sand Dollar’s boat operation. The boat itself was extremely cramped. I don’t expect luxury, but a little room to move is nice – and we didn’t even have a full load of divers, so I can’t even imagine how awkward that would have been. But more importantly, we didn’t feel like the divemaster was particularly useful. He only “led” the dive insofar as he cruised a little ahead of the divers. We signed up for a boat dive mainly so a local guide could point out cool stuff, but we did a better job of that on our own. In fact, the divemaster was the first person out of the water – something I’ve never seen before! We finished off the day with a dusk dive back at the house reef. Carol and Jeff had done a night dive several days before, and followed a DM’s instructions to find a little frogfish. Jeff was able to retrace their steps and find froggie again, though he wasn’t in a very photogenic spot. We also saw the usual suspects: peacock flounder, filefish. But as evening dives go, this was one of the least impressive I’ve had for some reason. There was a little bit of adventure at the end of the dive. We bumped back into Carol and Michael as we did our safety stop under the pier. Jeff signed to me that he wanted to go look for the frogfish again, but I was feeling pretty much done (it had already been over an hour, and I was getting chilly), so I waved goodbye to him and surfaced. I put away all my gear and waited. And waited. Eventually they all surfaced; apparently Jeff had convinced Carol and Michael to go after the frogfish. Except, Carol had thought from all his signing (“frogfish? 40 feet?”) that he meant he needed her to show him where it was, when in fact he was asking if she wanted him to show her. So she reluctantly trudged back to the frogfish, which she actually wasn’t interested in pursuing (end of dive, and she’d already seen it). Once they were all back on the surface, I went to move the truck closer so we could back in our gear – and it wouldn’t start. Completely dead battery. In the meantime, apparently I missed a rather spectacular fall when Jeff slipped on the dock and landed smack on his back. So we were all in an excellent mood by the time everyone had their gear piled up in our other truck (thank goodness we had two), and I put in a call to the rental agency.